Even after I shared two posts on my Saltee experiences I still have a lot to say. I love this place. When we arrived to Kilmore Quay to catch our motor boat, the sea looked rough. In the days of sail, the area around the Islands was known as “the graveyard of a thousand ships”. I cannot tell that I have a brilliant memory, but this sort of information somehow always gets stuck in my head. We boarded our boats – twelve in each – and off we went. Not wanting to get soaked in salty wate, I went inside the boat, and it was a grave mistake. The waves were rolling over the boat; a few times the wave hit the bottom of the boat so hard that I though it would break up in pieces. Half way to the island, fighting sea sickness I had to get out, and there I stood another 15 minutes all soaked but unable even to move to make myself comfortable. I barely remember the short trip on the inflatable boat; I was focused on staying conscious. It took me some six hours to completely recover – right before our trip back. We walked up the steps, passed by the owners’ house and headed to the Puffin place. The island was wrapped in fog. 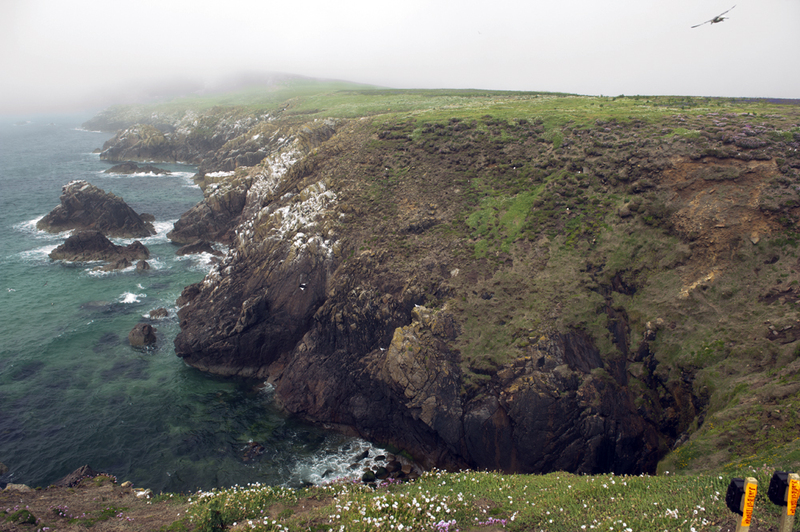 The cliffs surrounding the first bay near the cave known as the Wherry Hole are the nesting place for Atlantic Puffins. I am very glad to tell you that there were remarkably more puffins this year than the year before. Knowing that the birds return to their old burrows, I went to check out my buddy who made such a great model for me last year, and there he was – with some more neighbours, possibly his own grown up chicks from the previous years. 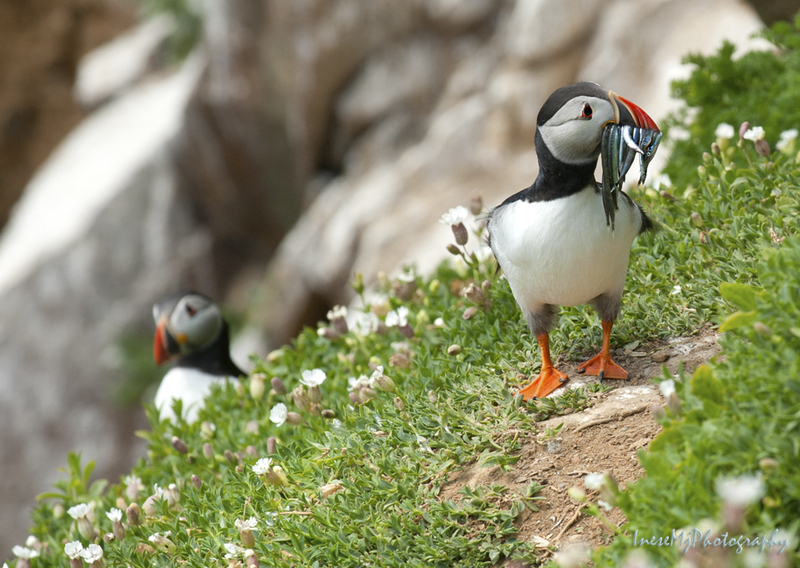 Puffins start breeding when they are five years old. They use their pre-breeding years to learn about feeding places, choosing a mate and nest sites. I went around for some more shots. The fun will start in the afternoon when the puffins go fishing and return with the bunches of the Sand eels in their beaks. 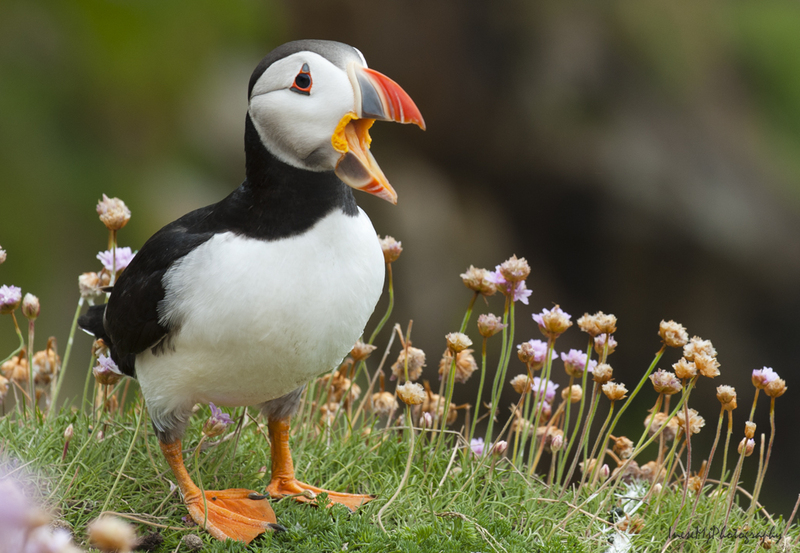 During winter, the beaks and feet of puffins fade in color, and every spring they turn bright orange again in preparation for the breeding season. The beak increases in size as the bird matures. 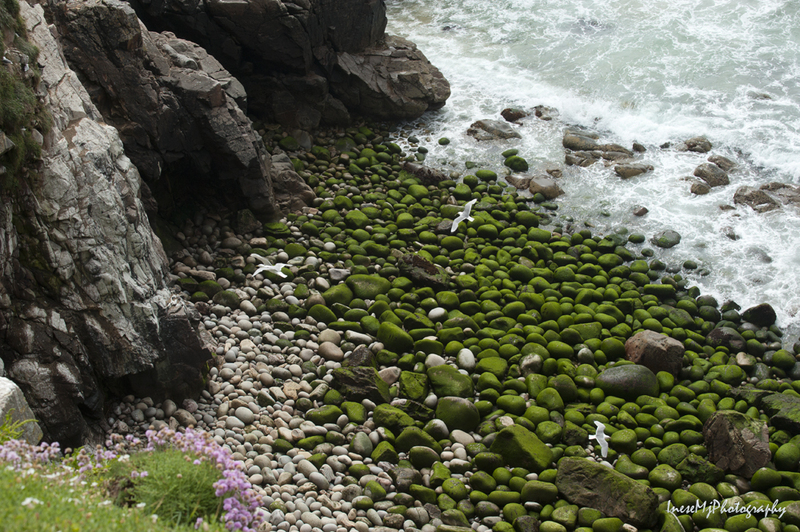 In this photograph you can see two cameras set up by the Ornithologists to watch the puffins. We came a couple of weeks too early: most of the puffins young haven’t hatched yet, but still we got lucky to see some feeding birds that afternoon. The puffin’s beak can hold up to 60 fish. 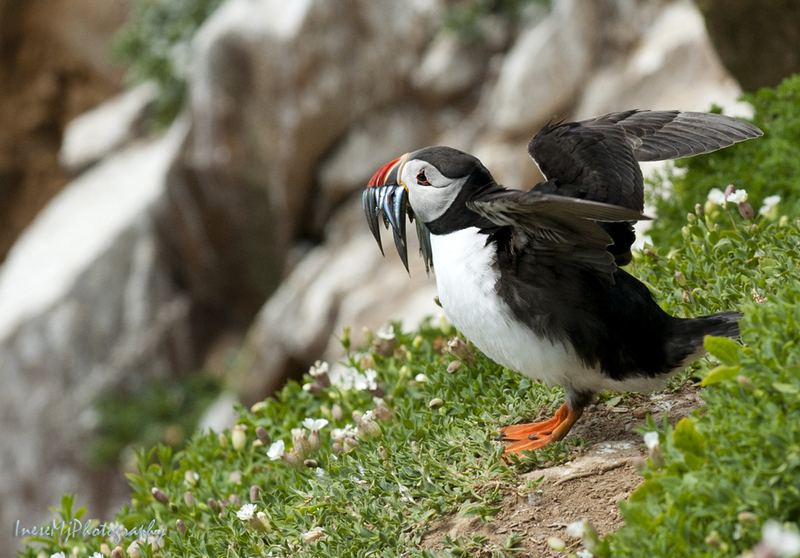 The raspy tongue holds fish against spines on the palate allowing the puffin to open his beak to catch more fish. We were lucky with the weather also. It was a dry day, a little bit overcast. It is difficult to take photographs of puffins in the sun because of their black and white plumage. A few more puffins. The couples stay together all their life. Males are usually slightly larger than females, otherwise there is no difference. This family is still working on their nest. Puffins lay one egg per year. 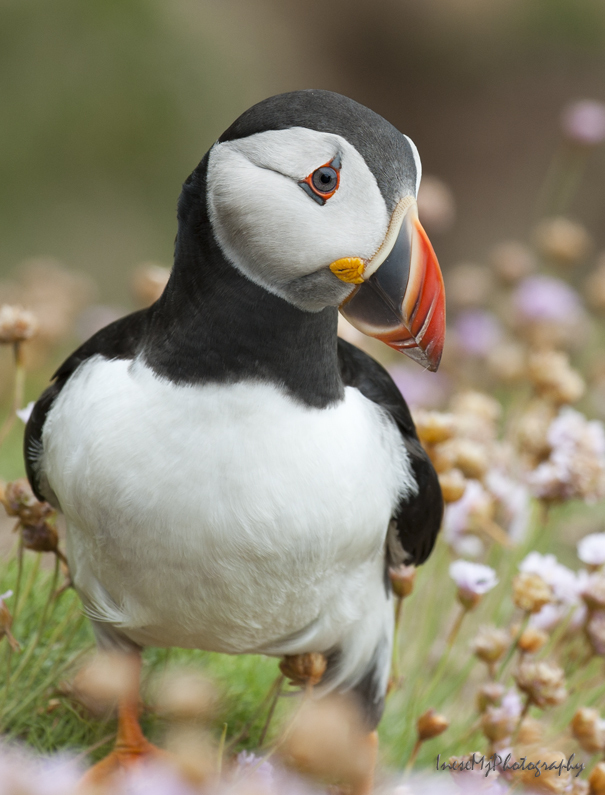 Puffins are very clumsy on the ground and in the flight. They are rather falling than landing, with a thud. In this photograph you can see some spots around the puffin. You might think it is some dirt on my lens, but it is the sand in the air. 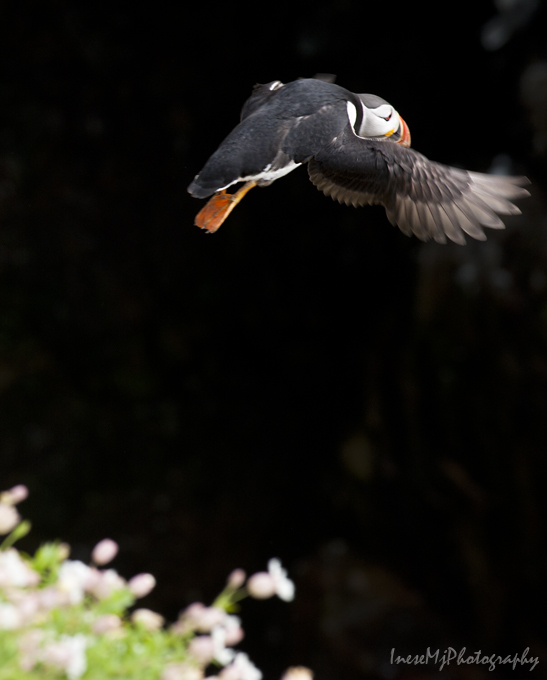 When a puffin is taking off he beats his wings and lifts up all the dust and sand. A puffin can fly 48 to 55 mph (77 to 88 km/hr) though. The wings can move so fast that they become a blur. 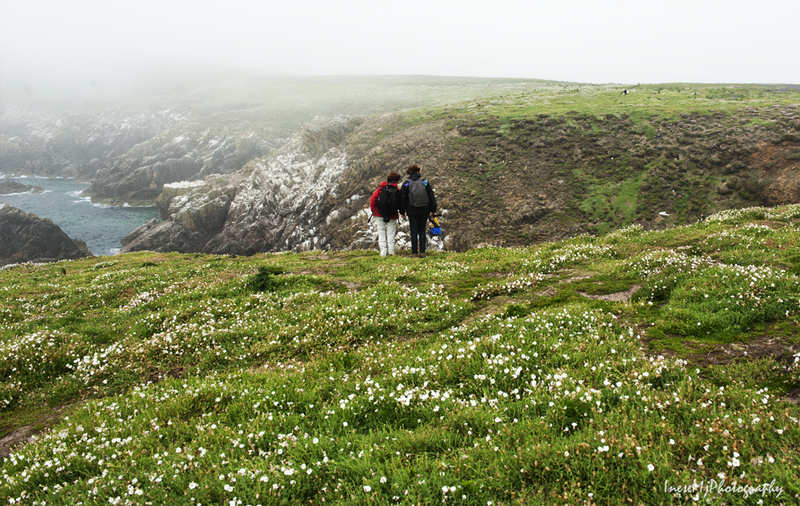 Great Saltee Island is some 2-3 km long. 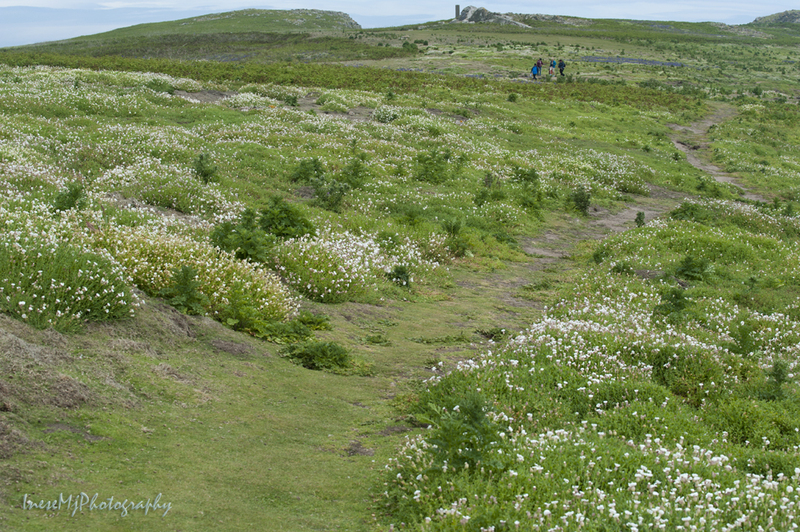 I am leaving the Puffins’ place and start hiking to the Southern part of the island along the well-trodden path. The islands were used as a base for pirates and smugglers for centuries. The gain of these folks could very well be hidden in the many caves, like the one in the image above, but there are treasures bigger than money, and they are not hidden anywhere. More from the Saltees in the end of the week. Hope you loved the puffins. I couldn’t find the place to reply to your comment about just being a photographer–probably problems with my PC screen. Anyway, it gave me the excuse to look at more of your work. Growing up I treasured albums of pics my dad took as a passing soldier of worlds that are gone. These were a neat contrast to pics being taken by my art student brother-in-law and his art student friend. Black and whites. I would think wow. To this day I believe there is no such thing as just being a photographer. Photographers are the eye of the world. Your photographs are wonderful. Oh my goodness!!! Incredible! I guess at that time he was just a promising art student 🙂 Isn’t it amazing? I admire his photography. He was just an art student and a very poor one with young kids. His wife Liz taught in my primary school. I mean what I say about your work. I love it. Thank you for sharing these breathtaking pictures. Oh thank you! You are too kind. I always say the truth. You have great talent. Nice shots–especially that one of the bird in flight. They’re such bizarre looking birds. The first time I saw a picture of them, I laughed myself silly. Oh thank you! They are funny looking birdies 🙂 However, when they are in the water, it is another story. I sent my partner a link to these and she was wondering where the islands are. I had no idea. Where are they?? Ireland, Co Wexford. 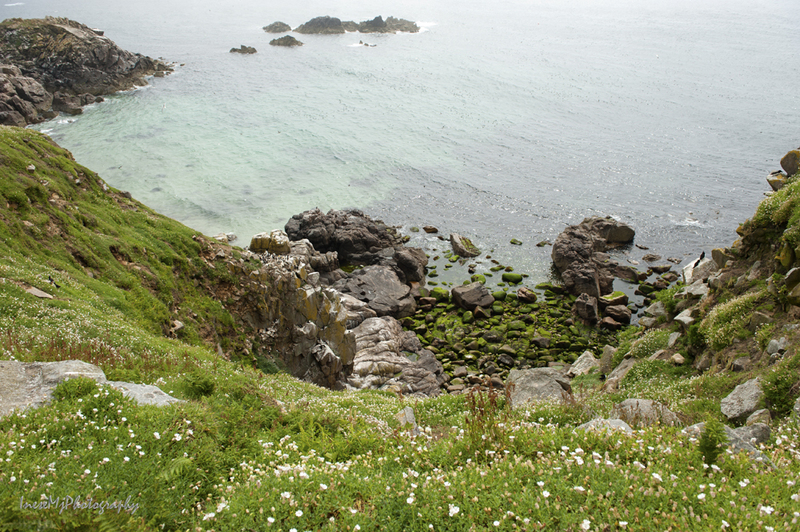 Great Saltee Island. 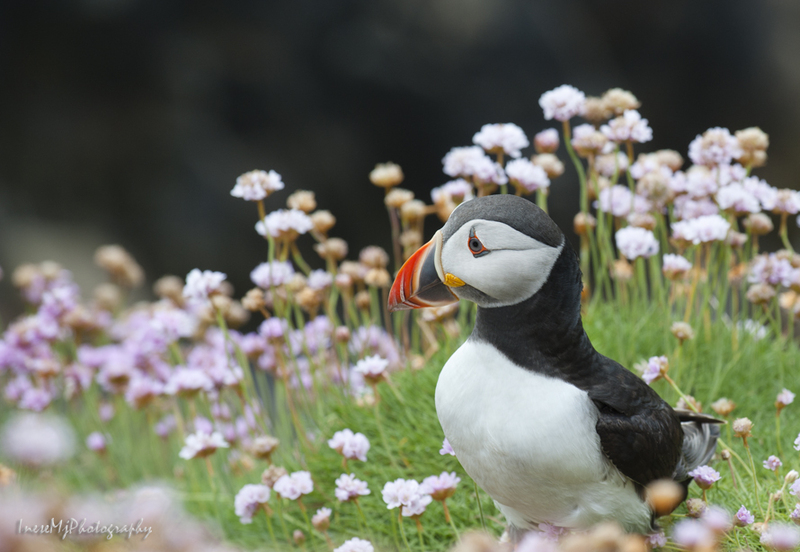 Fantastic Puffin images, I love them. Thank you! It was my second trip, and I look forward to going there next year again. 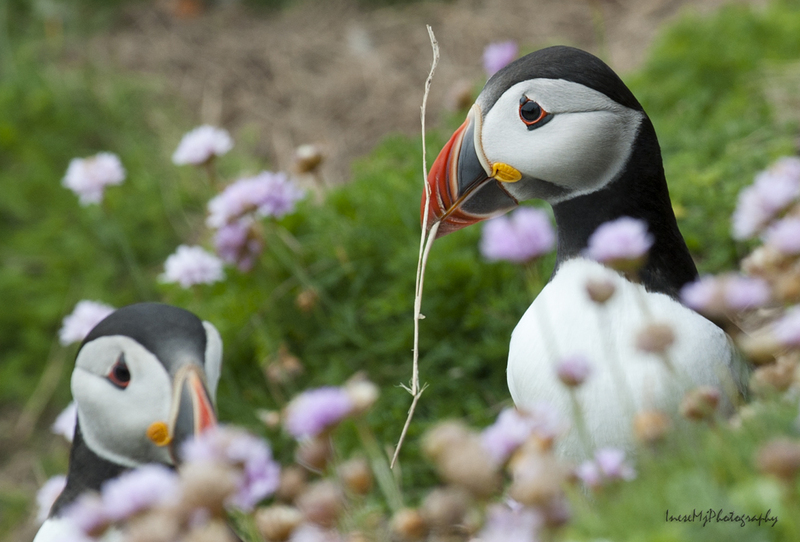 Such stunning photos of the puffins! Wow! 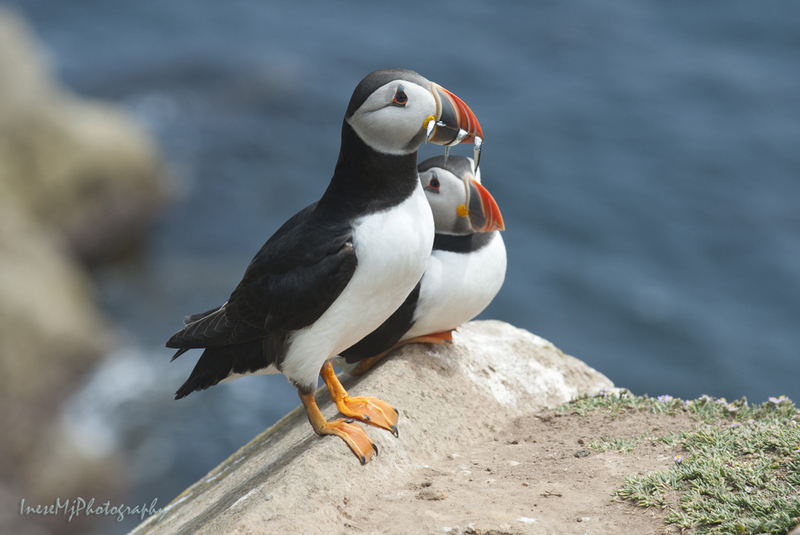 Your post and images make me fall in love with Atlantic Puffins – they are so adorable and cute! Did you use long tele lens to capture their pictures? Thank you Indah! No, I used my 70-200 for the puffins. I only have the lenses I can use for portraiture. Fortunately, I could get quite close to the birds when I was moving slow and no one else was around. 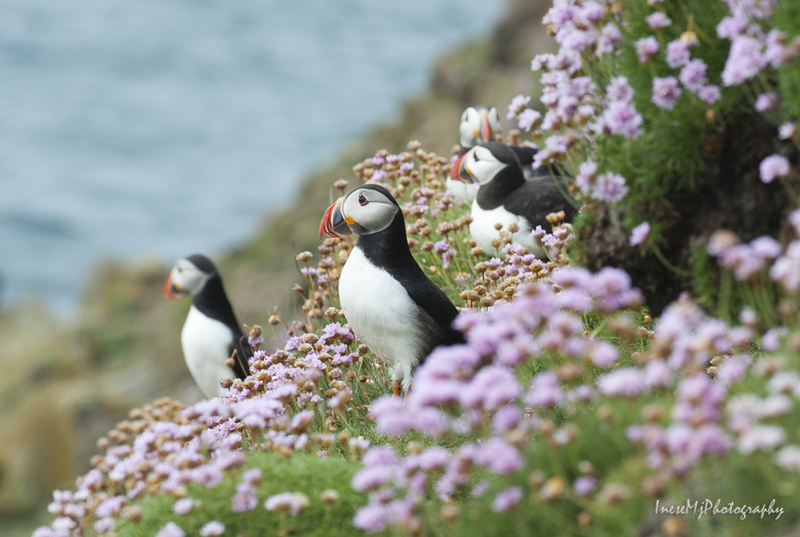 Beautiful images Inese, the puffins are such characterful birds. Thank you Andrea! I am in love with them – wish I could see them more often than once a year. Great photos. They are beautiful. Their sound is powerful. Do they let you be near to them? Thank you Marianne! I was able to get close enough. The birds are used to the visitors. I love puffins ! what marvelous photos You have taken. Makes me want to go there too.. Thank you! It is a marvellous place. Thank you! You would love being there. This is a beautiful island and I thank you for sharing it with us. The puffin is a species I also may have never been exposed too and many of it’s daily habits.Not only was this a beautiful post with your outstanding photography but an educational one as well. Thank you, Inese. Sheri, thank you so much for your kind comment! Another post of this series is coming tomorrow. Hope you both are feeling better and enjoy the little pleasures of summer weather. Our summer is now approaching 100 degrees. I prefer it a little cooler but I’ll be happy with what I have. The birds, bees and flowers are all happy and dancing in the breeze. I’ll be looking for the next post. Here it is, Sheri! Posted today. 🙂 Thank you for reading! I loved this post, Inese. 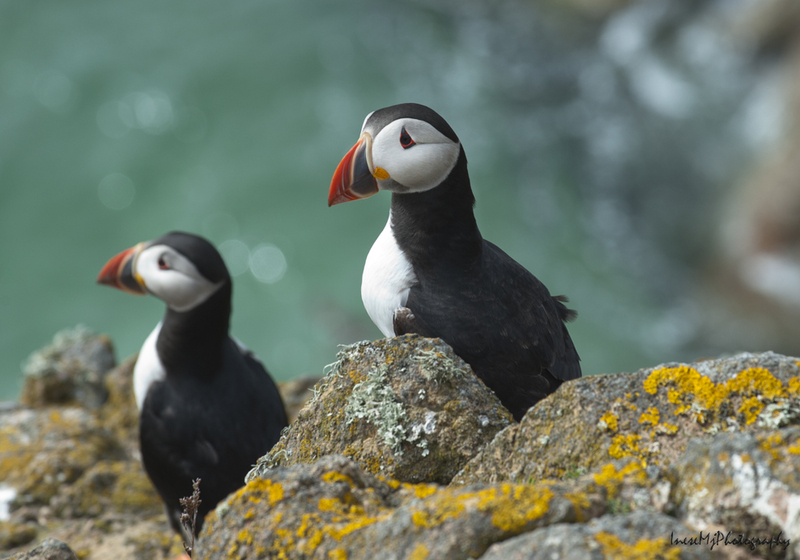 The puffins are adorable — and interesting information about them too. Sorry you had to endure seasickness to reach them. Once upon a time i was on a rough sea like that, in only a small fishing boat. At least i didn’t have to deal with it for the length of time you did. It’s terribly frightening. These are amazing, I’m totally crushing! Extraordinary adventure ,the place is amazing ,hope to read more about the island.Best regards. Thank you very much, Olga! Glad you loved the Puffins 🙂 The next one is coming Saturday – have been busy. Thanks again! 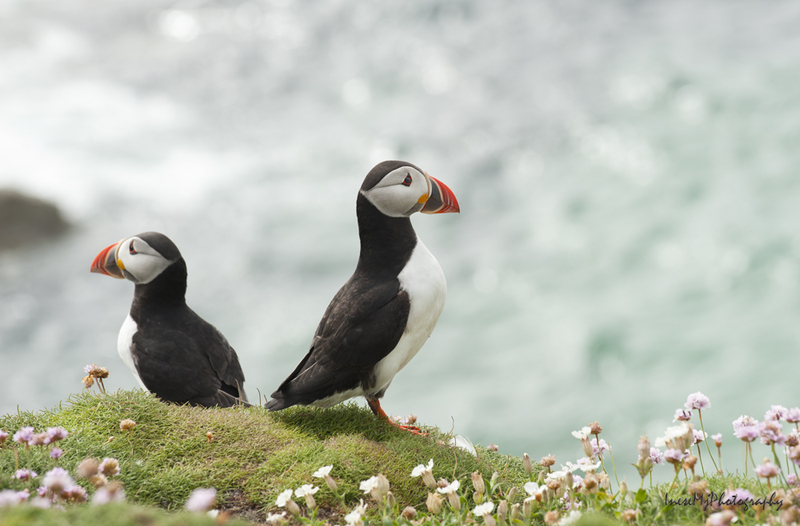 Beautiful photos Inese, and great facts about the puffin’s life as well…and as for the puffin sounds…very special. How fortunate you are to have been able to visit again….well worth the sea sickness, I reckon. Absolutely beautiful puffins!! Gorgeous pictures from Inese Photography!! Absolutely loved the puffins!!!! Their sound is very interesting too! Reblogging your beautiful pictures, Inese! Thanks for sharing!! Thank you so much for spreading the word 🙂 Puffin is the most amazing bird of the Atlantic. Thank you for your comment, Irene! Beautiful piece and beautiful blog! I really enjoyed this post, Inese. You really captured their personalities. Thank you so much Lisa! Glad you enjoyed the photographs! Oh yes, Penguin books for children, a yellow logo with a puffin on it! So glad you love these cuties. 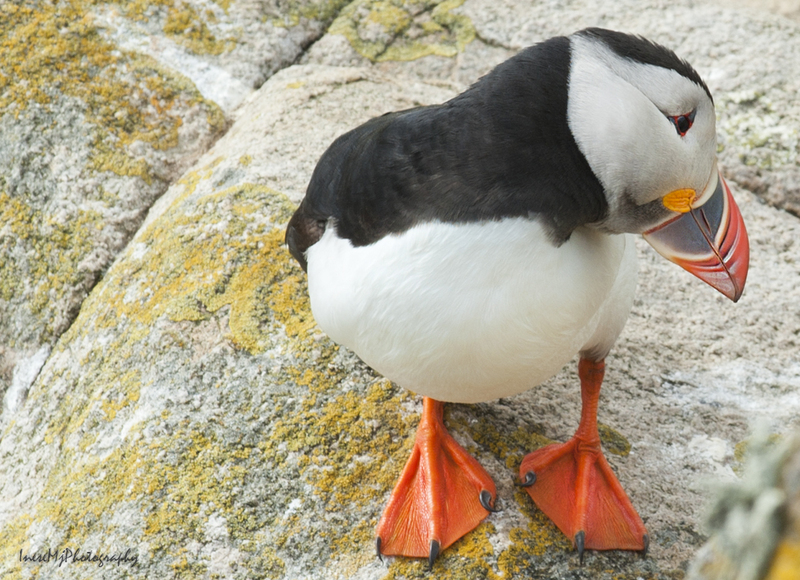 Did you listen to the link with a puffin voice? Oh you have to 🙂 Thank you for reading, and come back Saturday: i will post some more pictures. Thank you! The sweetest faces ever. I certainly don’t envy your boat trip, but am very appreciative of the wonderful images you’ve shared. Thanks for allowing me to vicariously enjoy the puffins! Thank you for your kind words! My dignity was shaken, but it could be worse. Yes, I guess dignity is a very small price to pay for such a wonderful experience. I couldn’t get the link to play on my computer 😦 My IT department (aka The Big T) will be home from the US this weekend and I have a list of computer problems to “share” with him. This record is not as funny as the one I posted, because in my record the puffin is sitting in the burrow, and in this record in the open. I’m very lucky to have a Puffin Island not too far away ( just off the coast of Anglesey in North Wales). 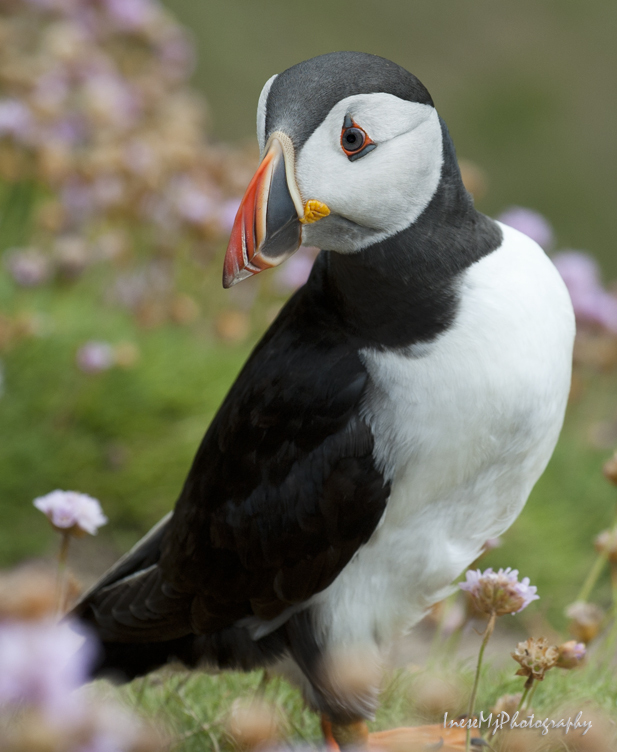 I think the puffins have a beauty unrivaled by many sea birds but what sad eyes they seem to have. Thank you very much David! So you can go there and see them whenever you fancy? Sounds like a paradise to me 🙂 Puffins live a long life, and probably see some sad things on the way. They are beautiful, but their looks don’t seem to be important to them. Wise little critters. Have a great day, David. Hugs!!! Incredibly beautiful! The photos are stunning! You should get an award for these. Totally Awesome! 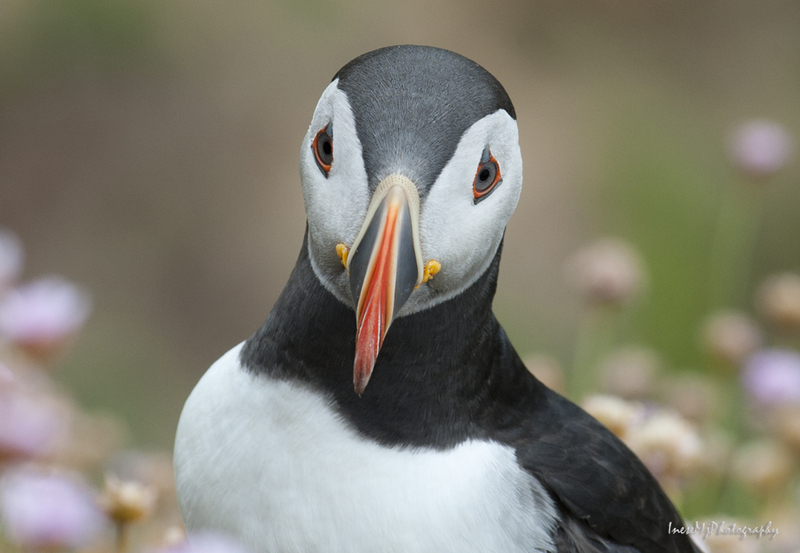 Love the puffins photographs! WHEW! Thank you! I wish I could get a glance inside their burrow and see their puffy fluffy baby. Thank you! Love the bird, what a cute face! Oh thank you, it is only that I love all the creatures of Nature. Thank you so much! Some place! You have captured these beautiful birds and their surrounding. They make me want to be there. I am curious, can you get close to the birds?